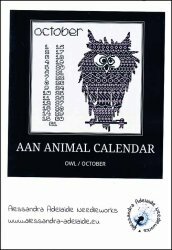 AAN Animal Calendar: October Owl [H5628] - $13.44 : Yarn Tree, Your wholesale source for cross stitch supplies. Cross stitch pattern by Alessandra Adelaide Needleworks. October is approaching & look whoooo's here! Mr. Owl is ready to be stitched for the calendar! Have a "hoot" of a time stitching this design! "Stitch count is 150 x 150.